Protect D4 cable connectors from damage and moisture when not in use. The cable dust cap protects the cable connector from damage and moisture when not in use. 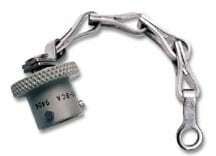 The chain can be easily and permanently affixed the cable to prevent loss. The cap can hang from the cable, when not in use. This cap will fit any D4 cable connector for DO sensors.